A historical adventure in four parts. 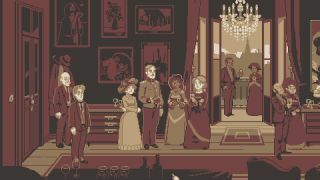 Somewhere deep inside the endlessly unfolding Free Games of the Week you'll find a recommendation for The Lion's Song: a beautiful pixel art adventure series, the first chapter of which was released on Steam for free. That was a brief story about a troubled composer working out in the Austrian Alps, while its follow-up tells the tale of an aspiring, equally unsettled painter. Episode 2 isn't free, but will set you back only £3.49. You can also buy the season pass of all four chapters for £8.99. "The Lion's Song: Episode 2 - Anthology advances into the depths of the human psyche, uncovered by visual artist Franz Markert. Franz is an aspiring painter at the turn of the 20th century, trying to immortalize his name within Vienna’s high society. His unique ability to perceive the flaws, fears and emotions in so-called 'layers' allows him to bring them – layer by layer – onto the canvas. "Doing so, Franz illustrates his very personal view on his models – quite distinctive members of Vienna’s society – as well as his perspective of the world and the time he is living in. Through his work, Franz seeks to uncover not only the layers of others but also his own. His layers, who he has sought his entire life - unable to see, feel or perceive them. Will he be able to impress the critics? Will Franz find himself? And who will help him as the doubts proliferate? "The choices players make in this episode will have a direct impact on the storylines of all future and past episodes, connecting The Lion’s Song to one overarching narrative. The decisions made will ultimately determine if the protagonists find the success they are working for."